I have a garden full of beans at the moment. They are not green, but yellow and purple. The purple ones turn green when cooked though. I’d love it if they stayed purple, but sadly they don’t. I remember the days when my mum used to cook vegetables to a grey, unappetising mush. To be fair, we didn’t know any better. Life was happier once we learned that briefly cooked vegetables taste better. 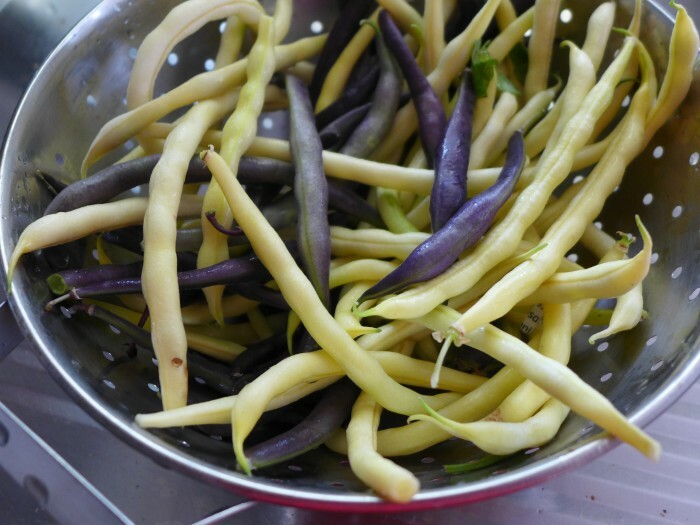 Beans are lovely just steamed or blanched and left crispy, topped with toasted slivered almonds and a dollop of lemon flavoured cashew cream cheese, or dressed with sesame oil, soy, miso, citrus and toasted sesame seeds. This is the way I eat mine a lot of the time. But, faced with several kilograms of beans, I thought of this recipe. I can’t remember where I got it from. I’ve been making it since the 1980s. It has a vaguely Turkish feel about it. 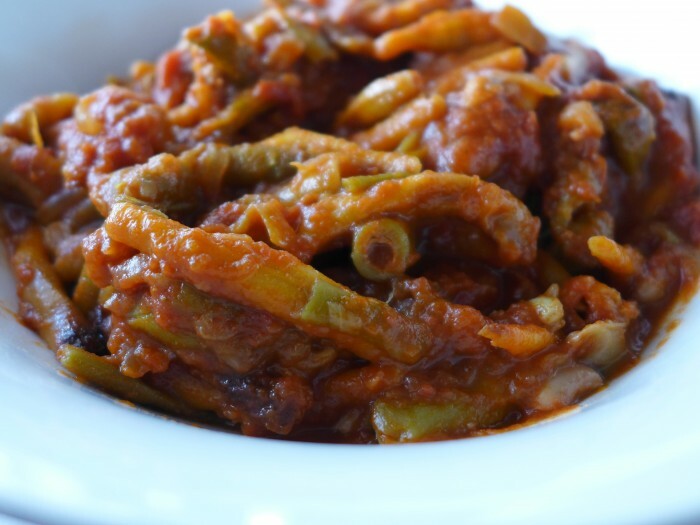 Green beans are cooked long and slowly until soft in a tomato based sauce, made with lots of onions and flavoured with garlic and roasted ground cumin. It is good for using up beans that have got a bit past it, both in size and age. It also keeps well in the fridge. This recipe is one of the where I am happy to overcook a green vegetable! It is great just eaten with good bread. Cover, bring to the boil and reduce to a simmer and cook for an hour. Check, stir and add water occasionally if needed. The beans should end up soft, with a sauce that is a thick liquid.